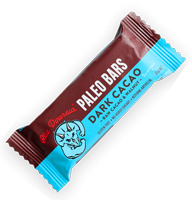 Made with fair-trade organic cacao and cacao butter. soy, dairy and gluten free. contains coconut. may contain traces of almond, cashew, hazelnut. produced on shared equipment with peanut, milk, wheat and soy. A savory twist takes our Simple chocolate to the next level. Hand-sprinkled fleur de sel (premium French sea salt). Visible salt crystals hit your taste buds first Followed by deep, dark chocolate flavor.